With most of the standard zookeeper experiences, you have to be at least 16 to get involved with the animals at close range. But luckily, the animal parks are catching on to the demand and are starting to offer experiences especially for children. These experiences are split into two themselves – Junior zookeeper experiences, which are just like the adult versions but specially for kids, and mini zookeeper days and zoofari adventures, which are aimed at younger kids. If you’re buying for somone over 18, take a look at our main zookeeper experience page. How are junior zookeeper days different from the adult days? They’re all pretty similar to be honest. The junior days tend to involve less hard work like shovelling and feeding, and the type of animals they choose are are generally safer and less likely to eat people! The days are usually shorter too, to take into account how kids will get tired faster. Usually about 3 to 4 hours, rather than a whole day for some of the longer adult experiences. 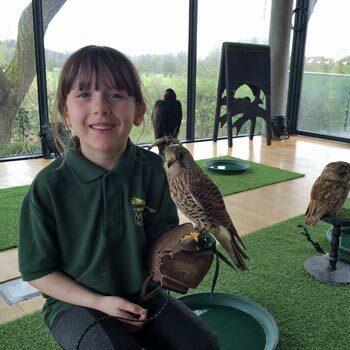 Generally, a parent will need to tag along and keep an eye out, but you’ll be used to that with kids anyway, and it’s a good chance to take loads of pics of the kids handling new animals – usually with a big grin on their face. (It’s usually the child grinning, not the animal). What sort of animals will they get to meet? You may have thought your kids would only get to meet boring animals like guinea pigs and goats, but we’re pleasantly surprised by the animals available. Obviously each zoo is different and each person’s experience will be a bit different too. Your average day at Chester zoo includes lemurs, tapirs, birds, otters and meerkats. It’s not lions and elephants, but the adult experience doesn’t really cover them either, so they won’t be missing out. The Dudley Zoo experience seems to offer a bit of giraffe action as well as the smaller animals, but again, don’t be disappointed if you don’t get it. The mini zookeeper experience at Paradise Wildlife Park is a bit different. The minimum age is a lot younger at 6, and so this focuses on animals such as wallabies and rabbits – you wouldn’t want to get too close to a giraffe at that age! Hi my son Is 13 and will be starting his GCSEs in September and really wants to take small animal care as he would like to work in a zoo. I thought the best present for his 14th would be to help out in a zoo so I was wondering how much it would be if there is any information I could get please. It depends where you live, but there are a few zoos that run zookeeper experiences for 14 year olds. You have to be over 18 for the zookeeper day, but some of the smaller animals take kids below 16. ‘zookeeper experience days near xxxx’ and make sure you look at the T&Cs for minimum ages.